FULL size clinical otoscope built like a Sherman Tank with the same excellent function and durability that Dr Mom Otoscopes are known for. This otoscope makes use of our largest optical quality scratch resistant lens. Handle and switch are built from a heavy grade aircraft aluminum. The amount of light produced for visualization inside the ear and the clarity of vision is second to none. Our otoscope uses a proprietary LED module built on a circuit board with a DC/DC boost converter and voltage regulation and will probably last a lifetime. Even if the LED ever fails our replacements are only $5 not $25-$30 like you would expect to pay for halogen from W/A. The otoscope is powered by 2 C cell batteries which may give the impression the otoscope is nuclear powered. We have had customers tell us in our smaller pocket pro model that the battery (one AA) has lasted over a year with regular use. This otoscope uses the same LED module so with 2 C Cells it may go for a couple years or longer. The battery savings alone compared to halogen (incandescent) should be substantial over time . Incandescent bulbs produce light by heating a fine filament. Halogen bulbs literally eat batteries. This is the perfect clinical otoscope for work in a third world country where replacement bulbs and batteries may be difficult to find. 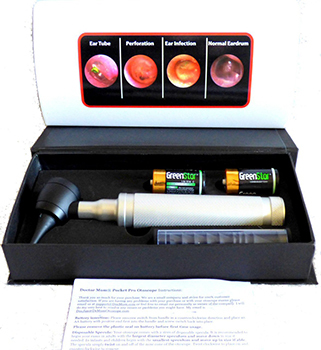 If you are a medical person and have used otoscopes in the past and have realistic expectations on what you are normally able to see inside the ear you will be especially impressed with this otoscope I guarantee. Give it a try. You will be impressed with what you get for not much more cost than a single Welch Allyn replacement bulb. You have nothing to lose with our 30 day unconditional money back guarantee. Purchase ours along with one of the expensive models and compare. I think you will be pleasantly surprised how well this one performs in comparison.